This woman is a Stanford professor, and the book contains many sly little jokes about Stanford undergrads. It was very nostalgia-making. 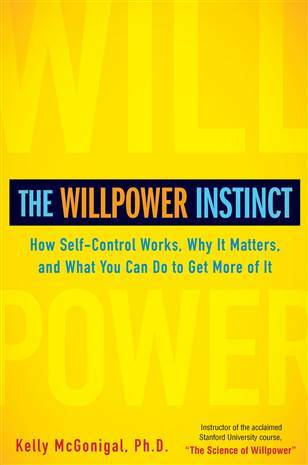 Okay, so I recently read this book, The Willpower Instinct, and it really brought up a number of interesting points on how to make yourself do things that are (in the short term) somewhat unpleasant. For me, this includes lots of stuff: usually I’d rather read than write, and I’d rather browse the internet than read, and I’d rather eat chocolate than salad, and I’d rather sleep late than go to the gym. In order to combat these impulses, I’ve learned to rely on planning and goal-setting. I tell myself that I’ll read for X number of hours in a week and write for Y number of hours and go the gym on Z number of days. Like most sensible people, I begin my benchmark week on Monday morning and I end it on Sunday night. This is because I have more free time on the weekend and I want to be able to pick up the slack of the weekdays get out of control and I can’t quite make my targets. However, I realized that the existence of this slack is fostering bad habits in me and it’s the reason why I sometimes fail to meet my goals. Because the truth is that the weekdays are actually much more predictable than the weekends: I know where I’ll be and what I’ll need to do. The weekends aren’t like that: it’s not uncommon for something to come up–some opportunity that necessitates changing all my plans. But when that happens, I actually have zero slack, because by the time I get to Friday morning, I’ve already effectively “spent” the weekend. I know that if I don’t write for 3 hours on Saturday and 3 hours on Sunday and go to the gym on both days and read this amount, then I won’t meet my goals. But, on the other hand, if I begin the week on Friday morning, then I have much more freedom. If I have a freeish weekend, then I can work as much as I’m able, and then I’ll have more slack during the week. On the other hand, if I end up doing things during the weekend, then I know exactly where I need to fit things into my weekday schedule in order to meet my targets. The key here is that I am going to move away from a system where I am mortgaging the end of the week and towards a system where I am saving up for it. If I begin the week with the weekend, then I know that I am never going to have more time during this week than I do right now. And if I don’t use that time wisely, then I’m going to pay for it later. Whereas if I continue like I have been (where I end with the weekend) then the weight is totally different. All week, I have the looming specter of an upcoming crunch time that may or may not actually happen. It’s actually pretty brilliant. I fully expect this system to take the world by storm. Calendars everywhere are going to be revised. You know what there aren’t a lot of? Children’s book authors who aren’t white. The Jewish week starts at Saturday sundown and I have my calendars set accordingly; IDK if it’s related, but I usually get a TON of work done on Sunday!